One of my family’s favorite ways to start the day is with a big colorful fruit smoothie. I’ve created a pretty big mental list of smoothies in my head, so that I can just check the freezer at any given moment and create something all of us will love. Before jumping into the recipes I wanted to give a few smoothie tips that help me construct really delicious smoothies every time. I always keep at least 4 base ingredients and restock weekly for our smoothies. Bananas, pineapples, coconut water and almond milk. These 4 things can take any smoothie to a creamy or tropical level. Since smoothies taste WAY better when using frozen fruit, always wait to freeze the fruit until it’s ripe enough. When the bananas start to spot, I’ll unwrap, chop and freeze 4 (which is enough smoothies for 2-3 days depending on how much other fruit I’m using in the drink) and when we use that all up, freeze the rest. If they go brownish in the freezer- that’s totally okay! They are still good and in fact will probably taste even sweeter. Frozen pineapple bought in the frozen section of the store can be super expensive if you’re making smoothies daily or even almost daily. We go to Aldi and buy 3-4 pineapples a week to chop and freeze on our own. Just do a sniff test to check the ripeness before cutting into them. Lastly, I’ve found it’s easier on my blender to only make up to two smoothies at a time instead of forcing more fruit all at once. So all of the recipes will be for 2 regular servings. Just half the recipe if you are making only one. Most of the ingredients can be found easily in your regular grocery store. I do purchase my Taro powder for the Taro smoothies on Amazon, though. Throw all the fruit into the blender and add 1/2 cup of coconut water. Blend on purée. If it seems like you need more liquid add the rest of the coconut water and blend until smooth. Throw the bananas, pineapple, almond milk and vanilla into the blender. Blend on purée. When combined, add the Taro powder and purée until completely blended. The pineapple whip is made by simply throwing a handful of frozen pineapple into the blender, a tiny splash of almond milk and a couple drops of vanilla extract and blend. It comes out thick and creamy like dole whip from Disney! Works really great as a nice cream, too. Throw everything into the blender and purée until creamy! You may have to scrape the sides a couple times and restart the blender so that you can get all the nut butter and chocolate in. And now for our family favorite smoothie.. This is just soooo good! It really tastes like carrot cake. And really what more can you ask for in life? Throw all the fruit and spices and 1 cup carrot juice and blend on purée! Add the other 1/2 cup carrot juice if you want it thinner. This is another great smoothie to serve with “pineapple whip” (mentioned under number 3, strawberry banana smoothie). Pour into jars, sprinkle some more cinnamon and enjoy! One last smoothie tip. You can add activated charcoal to any of the above smoothies (preferably the tropical as it’s got the most fruit) to detox or kick start a cleansing eating week. I buy activated charcoal off amazon and it’s completely tasteless, completely odorless and has a ton of great health benefits that you can find with a simple google search. If you add activated charcoal, please be sure to drink more water than usual on that day as you can get dehydrated! I’ve been wanting to write this post for awhile now and as we have just entered a new year, it seems a great time to talk about health goals and veganism. Every year, one of the most common goals I see being set is to “become healthy.” Seeing as getting healthy is a long process for almost anyone, that’s an entirely too broad of a statement or goal and it can be really overwhelming to set yourself up like that. I find it’s better to set goals throughout the year as you replace one bad habit with a better healthy one. There are so many reasons to be vegan and I am passionate about all of them (environmental, health and ethical reasons) but for the purpose of this post, I’ll keep it to how transitioning to a vegan plant based lifestyle can be done with ease. Most of my readers know that I became vegetarian as a child and a couple of years ago went vegan. A common misconception is that a vegetarian has a much easier go at getting to a healthy mindset and becoming vegan. Looking back, as a vegetarian, I can see a lot of the habits I thought were healthy were really just slightly healthier than a SAD (Standard American Diet) lifestyle. Most of my meals revolved around cheese. Cheese contains saturated fats and can lead to diabetes and heart disease. To say nothing for the fact that cheese can contain pus from cow’s bladder infections and that cheese can even be addicting! So, dairy had to go, in order for me to be healthy. I know my omnivore friends will say “I couldn’t ever give up cheese,” because I certainly said the same sentence to myself and others before I finally made the decision to educate myself and give it up for good. In fact, ask any vegan and I’m sure they will tell you they said the same thing! It can all seem really intimidating and like vegans are some overly big health fanatics that scrutinize every bite they take. That isn’t really true, of course, of most vegans. Actually all of those “weird” healthy habits were most likely picked up over time when they were replacing one bad habit with a healthy one. For instance, I was still chugging Diet Coke about a year and half ago when my sister mentioned she gave her Diet Coke habit up because of how horrible it is for our bodies. Everyone knows Diet Coke is terrible for you but it was the last truly bad habit I had leftover. I decided to give it up, too. I turned to lemon water and carrot juice and eventually added kombucha as one of my daily drinks, as well. I figured, if I’m going to give up something awful, I might as well experiment with drinks that are actually beneficial to enjoy it’s in place. So, going vegan. Once you make the choice that you’re going to give up meat, dairy and eggs, you should set some small goals for yourself to keep your body healthy so you’re not feeling overwhelmed with every little decision you make. In the beginning you might find meat and cheese replacement products to be a lifesaver and get you through the transition stage, but those things aren’t always the best for you either (even though so many of those products are absolutely DELICIOUS). One of the goals I set for myself when I first went vegan was to stop calorie counting. Not altogether, but to stop counting calories when it came to fruits and vegetables. So I might have eaten oil-free roasted veggies several times in a day, along with a large fruit smoothie, some mixed berries as a snack, and a midnight baked potato. That was in addition to prepackaged vegan goods I would prepare. The point was not to go crazy on the pre-packaged vegan foods, keeping those to a minimum, and to make sure I was getting most of my fuel from produce. It’s a really freeing thing when you stop worrying about every single bite you take, and when you’re filling up on fresh fruits and vegetables you’re going to feel better mentally and physically. Another thing that can seem extreme for many Americans is the thought of eating out less. We have busy, hectic stressful lives and limited time to cook. It’s just so convenient to order a pizza or swing through a fast food drive-through on your way home from a busy day. This is one habit that just has to go if you want to be healthier. For most people on a vegan diet, it’s also necessary to stop this routine, as most of us don’t live in cities with easy access to vegan cafes. There are tons of weekly vegan food prep sources out there if that kind of thing appeals to you. I’ve taken a looser approach and every couple of days when I get time to cook, I make 2 or more dishes that keep well in the fridge for 4 days up to a week. The stress is completely off when you have healthy pre-made dishes waiting for you to heat up when you get home. 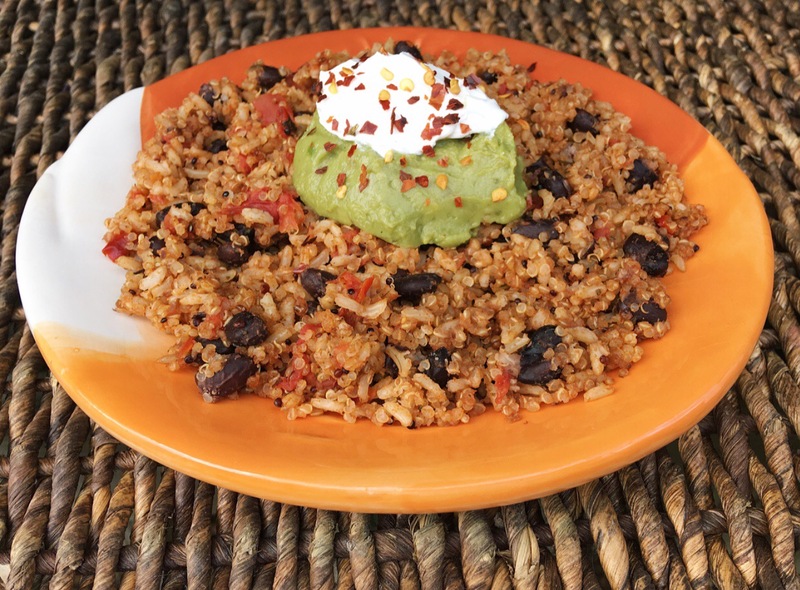 Try to have at least one or two grains available (quinoa, rice, pastas) and pre-soaked or rinsed beans in the fridge. Once you have a grain and a protein, adding vegetables can take just a few minutes. According to the Mayo Clinic, most Americans get twice the amount of protein we need. The diet industry will have you believing we all need a massive amount of protein to get through the day. That simply isn’t true. Plant have all the protein you need. As far as vitamin b12, I would love to do a blog post on that alone in the future. I do take a liquid form of plant based vitamin b12 and feel that everyone-vegan or not- should do the same. Low vitamin b12 levels is a pretty common issue, and seeing as how most people aren’t vegan, most of those deficiencies are coming from people with an omnivore diet anyway. I’d love to hear from my readers and invite you to join in on the conversation in the comments below. I’ll be ending this post by suggesting some documentaries (many are on Netflix, Amazon prime or YouTube) that will help you make the best choice for your health, morals and our environment. Oh and.. Have a wonderful and healthy 2018! Although I’m late sharing this recipe (I shared the picture last week on Instagram), it’s truly better late than never because these are worth making ANY time of year. I made several types of bliss balls throughout the holidays because it was nice to have a quick and satisfying snack to pull out of the fridge during all the wrapping, shopping, visiting and baking. The strawberry bliss balls were my absolute favorite and taste just like little muffin bites! Even better that these are no bake and super quick and easy to make. In a high speed blender or food processor, blend the sunflower seeds until smooth. You may have to scrape the sides a few times between blending. Add your strawberries, oats, maple syrup, vanilla and half of your coconut flour into the blender. Blend until smooth, scraping the sides occasionally. Feel the mixture and if it’s too sticky to ball up easily, add the rest of the coconut flour and blend. Transfer the mixture to a bowl and roll into little balls (the size of donut holes). You can roll some or all into the coconut flakes as topping. I did half in the coconut flakes and left half bare. Makes about 16-18 bliss balls. Serve immediately or store in an airtight container in the fridge up to 5 days. I enjoyed these even more after they sat in the fridge overnight. What can I possibly say about these mini raw cheesecakes that could do them justice? I truly didn’t expect these to come out so great, but when they did I knew I had to get some pictures and share the recipe with you all! I’ve been experimenting with recipes the past few weeks, to kind of decide which desserts and dishes to have around for the holidays. These babies made the list quick. After my last junk food recipe (which is also SO worth it) it was time to make something completely guilt free and healthy. Yep! These are healthy cheesecakes! No bad ingredients, no baking and nothing complex. The only things required to assemble this recipe is a blender (or food processor), a couple of spoons, a bowl and some silicone cupcake molds. These cheesecakes are taro and almond butter flavors but feel free to substitute the taro powder for another flavor if you can’t find it . I get mine on Amazon. I wouldn’t switch the macadamia nuts in the crust (unless you have an allergy) because that just really adds something lovely and ties it all in. In a food processor or blender, mix the medjool dates and macadamia nuts until it’s all nice and sticky and can be pressed together easily between your fingers. You may need to scrape the sides of the food processor a couple times while blending. Sprinkle some coconut flour into the bottom of 12 silicone molds. Ball up about 1/2 tbsp of the date mixture and press into the bottom of the silicone molds. It should be about 1/4 inch high. Rinse the blender or food processor and add cashews, lemon juice, maple syrup and vanilla. Blend until completely puréed. There should be no cashew clumps. Pour half of the mixture into a bowl and leave half the mixture in the blender. Add the taro powder to the batter in the blender and purée well. Pour that mixture into 6 of the silicone molds and take a spoon to spread the top evenly. Add the almond butter to the batter you poured into a bowl. Mix well with a spoon. Pour that mixture into the remaining 6 silicone molds and spread evenly with a spoon. Sprinkle some toppings on each cheesecake. Freeze for at least 2 hours and remove from the freezer 20 minutes before serving. I find it easiest to remove the cheesecakes from the molds while it’s still frozen. I use to make a simple pumpkin pie dip throughout the Holidays but since going vegan, I wasn’t sure how all the vegan alternatives would work in this. I’m SO glad I took the time to find out. This ended up being the best pumpkin pie dip I’ve ever had. My taste tester, Zoe, agreed that it’s delicious. This recipe takes just a few minutes and when you’re done licking the spoon (you WILL definitely lick the spoon!) you can use this as a dip for any vegan graham crackers, gingersnap cookies, pretzels and even apples and bananas. I’m betting a dollop of this on top of your favorite vegan pie would be heaven, too. Even though I enjoy and love eating and posting more healthy vegan recipes, this one is certainly a junk food. Holidays are a pretty good reason to enjoy a little bit of junk food here and there! I find my vegan ingredients from a local health food store but I’ve heard that Kroger carries these vegan alternatives at some locations. If you plan to make this for a large Holiday gathering, you may want to double the recipe. Add cream cheese, pumpkin purée, sugar, pumpkin pie spice, cinnamon and nutmeg to a bowl and mix well with a hand mixer until completely combined. Gently fold the whipped cream into the pumpkin mixture with a large spoon until blended. Lick spoon and start dipping your crackers, cookies and/or fruit! You can serve immediately or store in the fridge for a few days (if it lasts that long!). Another one pot dish! Which we all know is perfect for busy Fall and Winter schedules. This is, by far, the easiest recipe I’ve shared so far and I hope you and your family enjoy it as much as we do! I make it at least once a week and serve it up a little differently each time. In the photo, I have it topped with guacamole and Tofutti sour cream. Rice and bean tortilla chips on the side (not pictured). It was pure taste bud pleasure! You can do some much with this recipe! Toss it in a Buddha bowl with greens (spinach/ broccoli) and some crispy tofu. Try it in a burrito with romaine, peppers and mushrooms. This goes amazing over top a baked sweet potato, too! One of my favorite ways to serve this, as a lunch dish, is to toss some leafy greens with lemon tahini dressing and mix the tomato basil blend in the salad. Really the possibilities are endless. I found a quinoa/ brown rice blend at Aldi’s and I’ve seen some at Kroger, too. I imagine it shouldn’t be too hard to get ahold of but if you can’t, just do equal parts brown rice and quinoa for the blend. In a medium pot bring water, diced tomatoes, onion powder, garlic, basil, tomato paste and paprika to a boil. Add the quinoa and rice blend. Stir well, cover and reduce heat to low. Allow to simmer on low for about 20 -25 min, stirring ocassionally. When all the water is mostly soaked up, add the black beans and mix well. Cover and simmer (stirring every couple minutes) until all the water is completely soaked up and rice and quinoa are tender. About 7-10 additional minutes. Salt and pepper to taste. Remove from heat and let cool for 5 minutes. Serve immediately and/or store in air tight container for up to 3 days in the fridge. If you think of any other creative ways to serve this dish up, let me know in the comments! More delicious fall foods! I’m all about the pumpkin things in October (who isn’t!? #Basic). 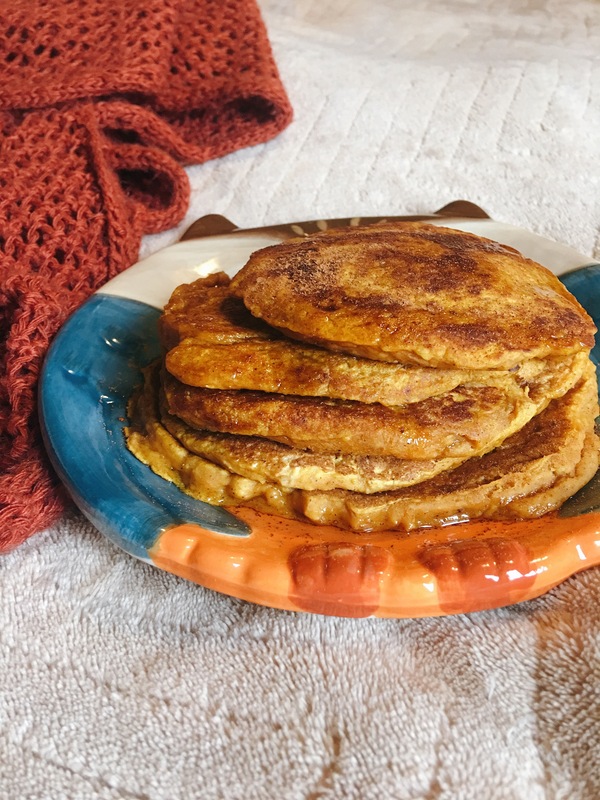 I’ve been wanting to whip some pumpkin pie pancakes up for a couple of months now. They aren’t gluten free but if you replace the flour with almond flour please let me know in the comments how they turn out! These turned out fluffy and not at all dry. I think they make a perfect breakfast in bed food, hence the photos taken in bed (and not at all due to the bad lighting outside that day! Ha). No really, these are THE dessert food of breakfast. In one bowl, whisk together the flour, nutmeg, ginger, 1/4 tsp cinnamon, brown sugar, baking powder, rolled oats and ground cloves. 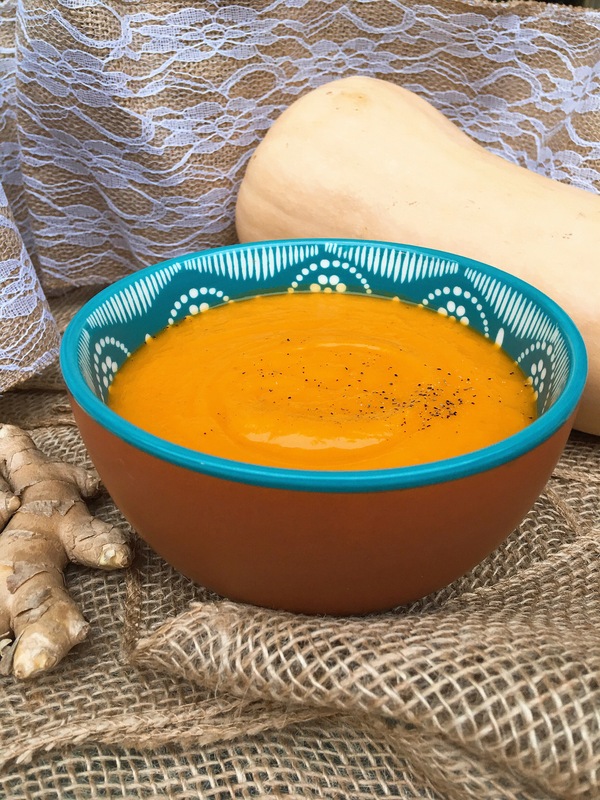 In a separate bowl, whisk the pumpkin purée, plant milk, vanilla and pumpkin pie spice. Add the wet ingredients to the dry ingredients and whisk thoroughly. Warm a medium pan on medium heat on the stove and lightly spray with cooking oil. Spoon about 2 tablespoons of batter per pancake and gently spread the mixture out, once it hits the pan, so that isn’t too thick. Work quickly here because it starts to cook when it hits the pan. When you see the sides firming up after a couple minutes, flip, and allow that side to firm and lightly brown, as well. Continue with the rest of the batter. Top with cinnamon and maple syrup and serve immediately. 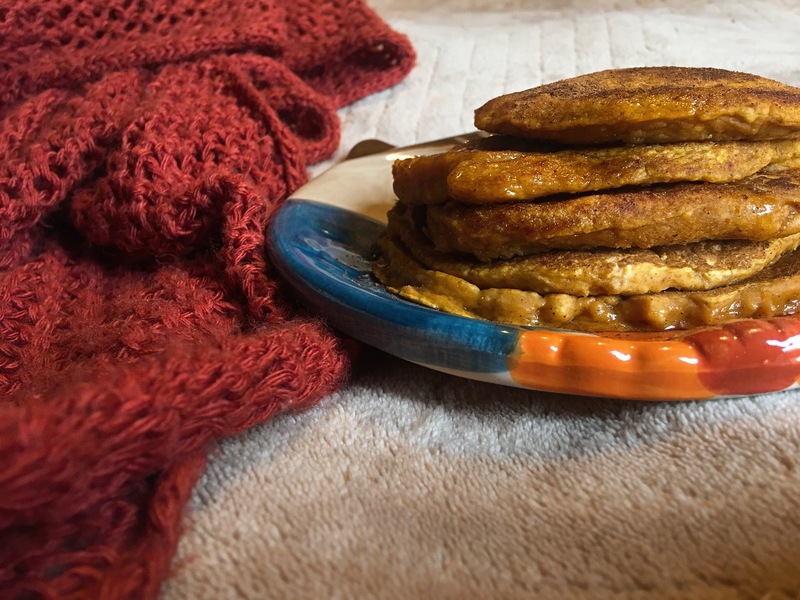 I’ve finally gotten some time to share another favorite fall recipe. 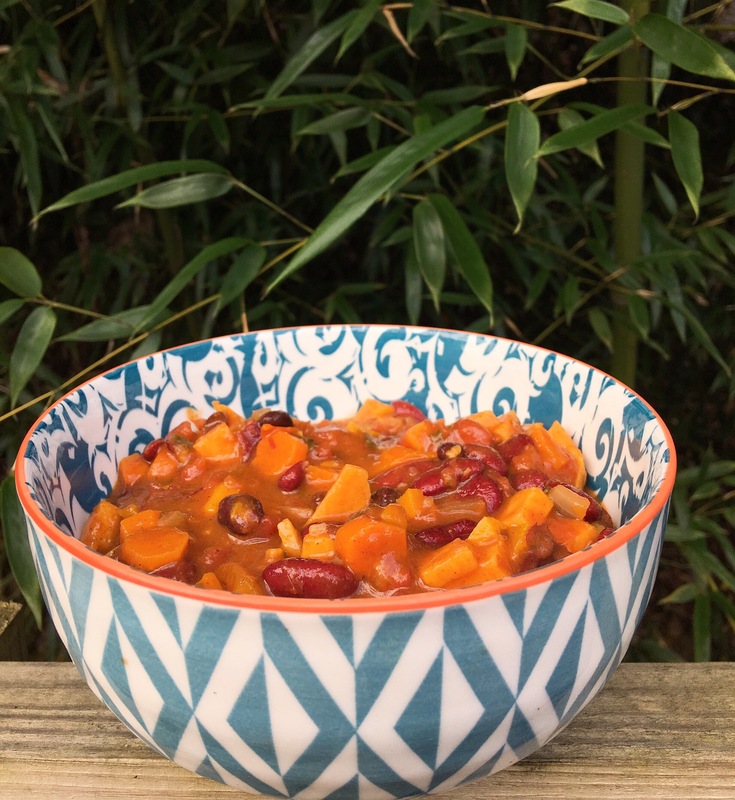 This sweet potato chili is perfect on rainy days, although I admit to even making it in Summer. It really is so good and addictive. With all the savory and filling flavors, this chili is bound to go over well even with non-vegan family and friends. As an added bonus, this is a one pot dish! In a large pot, add your tomato paste, 3 tbsp water, red onion, spinach, garlic and ginger. Sauté on medium until the onion is slightly softened (about 3-4 minutes). Add 2 cups of water, the full can of diced tomatoes , sweet potatoes, carrots, peppers, mushrooms, chili powder and cumin. Boil for 10 minutes, stirring occasionally. Add the beans. If you need another cup of water, add that now. Boil on medium for an additional 20-25 minutes, stirring occasionally, until sweet potatoes and carrots are soft. This chili holds well in the fridge for 3-4 days and can actually even taste better as a leftover! Tip- I love to drop a half an avocado in my bowl of chili while it’s really hot. When it cools, you’ll have a super soft and creamy avo. Better than crackers, I think! (My kids prefer the crackers.) It’s also great with blue corn chips. My first blog post! Since I’m starting out with a recipe, I figured I would do a quick little introduction on why I’m starting a blog. When I was 12 years old I became a vegetarian and about 2 years ago I went completely vegan for my health, the animals and the environment. There’s so many reasons to be a vegan that for me, it just didn’t make sense to keep consuming dairy. I might talk about those reasons in more detail in other posts but since this is mostly about a really delicious fall recipe, I’ll just keep it short. Since turning plant based vegan, I have been on a mission to make super tasty and (mostly) healthy recipes that anyone can enjoy. My daughters are my usual taste testers and if they love something, I know it will be a hit. I want everyone to enjoy filling plant based foods and I’m hoping even meat eaters will see that vegan dishes can be BETTER tasting than the non vegan things they are use to. So, this SOUP! It is everything good about Fall in one bowl. I really hope you make it and enjoy it as much as I do. It’s definitely one of those recipes where you want to do the dishes as you go so it’s not totally piling up on you. Roast butternut squash on a pan that has been lightly sprayed with cooking oil, on 425 degrees for 25-35 minutes. Flip the squash over half way through the cooking time. Check occasionally. You want it soft but don’t let it burn. Set aside and allow to cool. Boil the carrots in a small pot until tender (about 12 minutes). Set aside and allow to cool. In a small nonstick pan add tomato paste, garlic, ginger, onion and a tablespoon of your vegetable broth. Sauté on medium until the onion is tender. Put your butternut squash, carrots and tomato paste/ onion mixture into a blender and purée until smooth. Tip- This also goes really well over some gnocchi if you have leftovers.